Many places have a mountain they call the Sleeping Lady, this is ours. 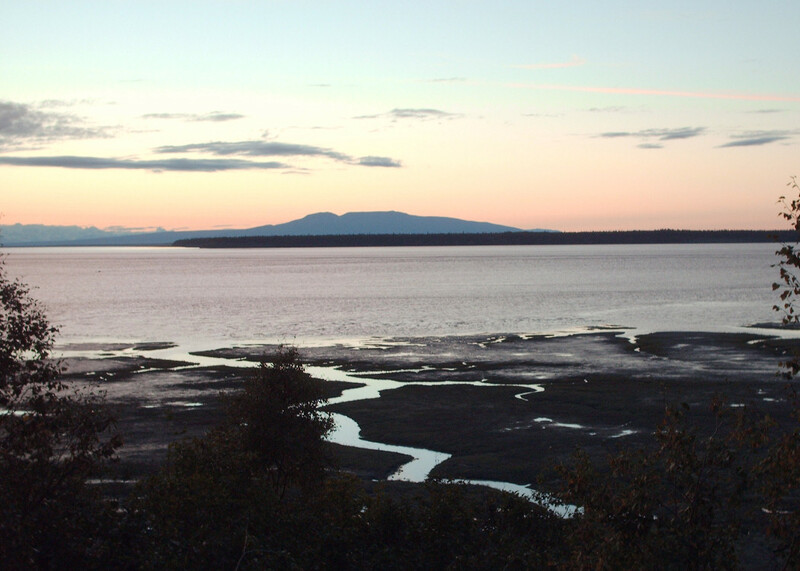 Mount Susitna.The photo was taken from a place that looks over the inlet in downtown Anchorage. Sleeping in the Land of the Midnight Sun can be hard in the summer. The sun comes up around 4:30 am now, and goes down around 11:30 pm. Dusk and twilight last a while so there is very little true dark in the night. The sun makes people think it's earlier than it is, and kids are out playing until sunset, neighbors are grilling that late too sometimes. When I was a kid, I loved it, instead of reading under the covers with a flashlight, there was enough light coming in my windows to read by that. After the dark and cold of winter, playing in the sun until it was late was wonderful. As an adult, it's a bit harder. There is more reason to keep a regular schedule, but sometimes it's very hard to get to sleep. It's still daytime! Go to bed! Even if I don't feel tired. If I stay up later, I might sleep later. Mind games- laying in the semi-dark, when I'm not feeling sleepy enough to sleep can be hard. I've found playing games in my mind helps. Alphabet games like trying to name a flower that begins with each letter of the alphabet, alternating male and female names through the alphabet, building structures or trying to draw fractals are all tricks I use. Your own interests might be different. Try making up a cake recipe from scratch, or counting in prime numbers. Breathe - breathe deeply and evenly like your sleeping. Using this with playing games in my mind with my eyes closed is usually enough. Rolling eyes- Your eyes move a lot while you're sleeping. When you close your eyes, trying looking down and see how it changes your breathing, then try rolling them up and see how that changes your breathing. Don't roll them uncomfortably like you're trying to see your brain! Just a little bit of movement helps sometimes to relax. Occasionally it's necessary to take something to help get to sleep. Fred Meyer's coupon for Vick's ZzzQuil . ZzzQuil is not for pain, not for colds, it's a non-habit forming sleep aid.